Perfect family reunion type cabin. Cabin sleeps up to 22 in beds. There are 8 bedrooms and four bathrooms. On the main floor there are three bedrooms two with queen beds and one with a double. Upstairs there is a sleeping loft with two single beds and one bedroom with a queen bed. Downstairs there are four bedrooms, one with a gas fireplace and king size bed, one with a queen bed, one with a queen bed and bunk bed and one with two bunk beds. The six-foot round dining table has a lazy susan and seats 12. The kitchen has an extra refrigerator on the covered deck area. There is a circular fireplace and plenty of living space in the large living area. There is a two-car parking deck with plowed parking along the lot next door, which is owned by us. The lot next door can be used for your private sledding during the winter. The cabin is located outside Tahoe City. 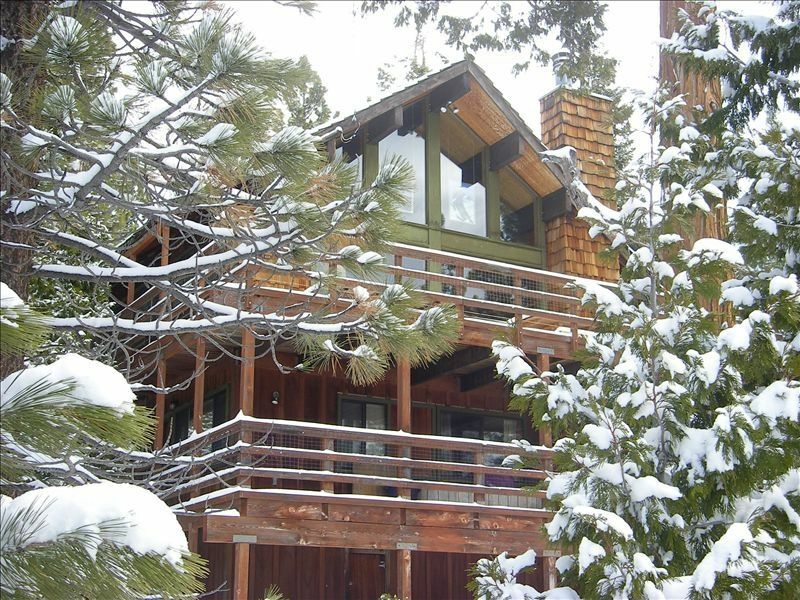 We are within minutes of 3 major ski resorts, downtown Tahoe City and many wonderful parks and Tahoe beaches. It is within walking distance to North Tahoe Cross Country Ski Area. We are also within a short driving distance to the Nevada State Line (north shore), Incline Village, and Reno, Nevada. While planning your stay, keep in mind the many recreational activities that are available, both in the winter and summer months. Please note this is a cabin! It has no TV or phone but it has WiFi and plenty of games and puzzles. If you are interested in getting away from it all with family or friends, not just going to a beautiful spot and watching TV, this place will work for you. Please send an email by filling out the inquiry link. Our father built this cabin in 1967 and we have been updating and adding space ever since. All the bathrooms have been remodeled but in deference to our father we have kept the cabin TV free. He wanted it to be a cabin for families and time together and we have tried to abide by his wishes. We own the lot next door that we use as a sled run in the winter. Additional tables and seating for 25. Check in at 3 pm. Check out is at 10 am. The cabin was very spacious, having enough rooms so that no one had to sleep on the floor, also being located only 6 min away from a local Safeway was very convenient. Great place to stay with big families. More than you could ask for. House has a beautiful kitchen and a prime location. Can’t imagine having anything more for a weekend by the lake. Excellent for a great group experience! Nicely appointed, all the amenities, well-stocked kitchen, and loads of communal space for relaxed gathering and chatting. Thoroughly recommend! The rental was beautiful and as described. It was accommodating for our family and the children we were with. The open concept second floor was great to hang out. The majority of our time in the cabin was spent on the main floor, the kitchen and living room are conjoined so it was nice to be able to cook and conversate with the rest of our party. The kids had a blast in the loft area. It was especially convenient to have an open space in the bbacyard for the smaller children to sled and play in the snow. Squaw Valley was really close, only a 20 minute drive, and several shops only a couple miles away. Definitely recommend this rental! If you want a comfortable, beautiful, and relaxing getaway then this is the rental for you! It was absolutely beautiful and the cabin had everything we needed. We especially loved the Christmas tree that was on the top balcony. The cabin has a beautiful fireplace where our family sat around and shared many smiles. I wish I could post pictures of all the fun times we had. I guarantee if you stay here, like us, you will plan to return. Cancellation: - A sixty (60) day notice is required for cancellation. Cancellations that are made more than sixty (60) days prior to the arrival date will incur no penalty. Cancellations or changes that result in a shortened stay and are made within 60 days of the arrival date, forfeit the full advance payment and damage/reservation deposit. Cancellation or early departure does not warrant any refund of rent or deposit.